West Bengal Co-Operative Service Commission is going to recruit fresher candidates in India for Clerk, Assistant/ Supervisor Posts. So, those candidates who are willing to work with this organization they May apply for this post. Last Date of Apply 19-August-2017. Total numbers of vacancies are 65 Post. Only those candidates are eligible who have passed Graduate in any discipline with 50% marks in HS + DCA or IT or Equivalent accredited by AICTE. Indian citizen having age in between 18 to 40 years can apply for this West Bengal Co-Operative Service Commission Recruitment 2017. 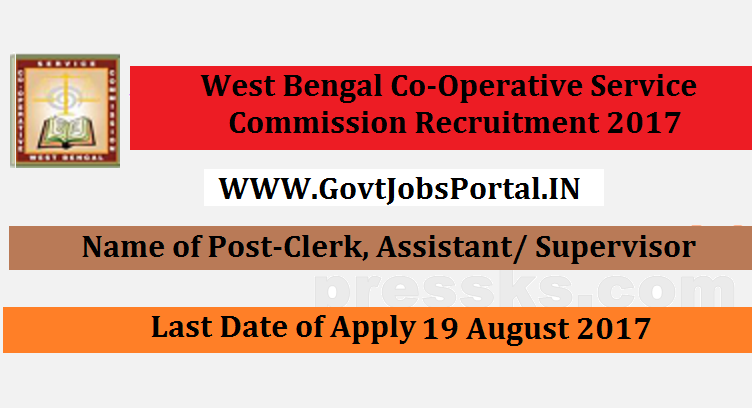 Those who are interested in these West Bengal Co-Operative Service Commission jobs in India and meet with the whole eligibility criteria related to these West Bengal Co-Operative Service Commission job below in the same post. Read the whole article carefully before applying. Educational Criteria: Only those candidates are eligible who have passed Graduate in any discipline with 50% marks in HS + DCA or IT or Equivalent accredited by AICTE.